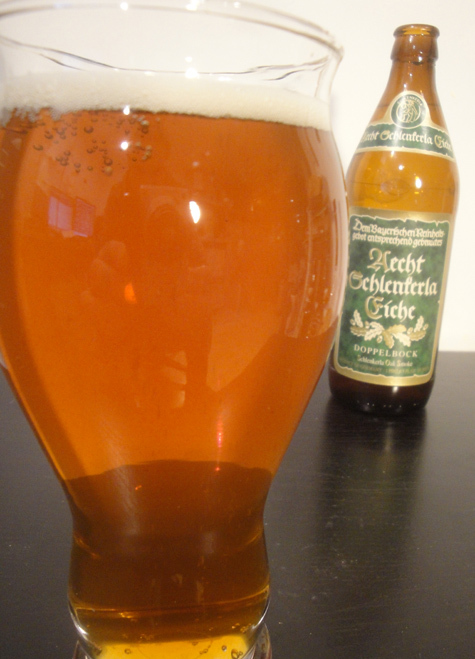 Lucky for me I stopped into one of local Beer Stores, Amanti Vino and the Beer Manager, Thad said they had just got in the Aecht Schlenkerla Eiche Oak Smoked Doppelbock and I should try it. 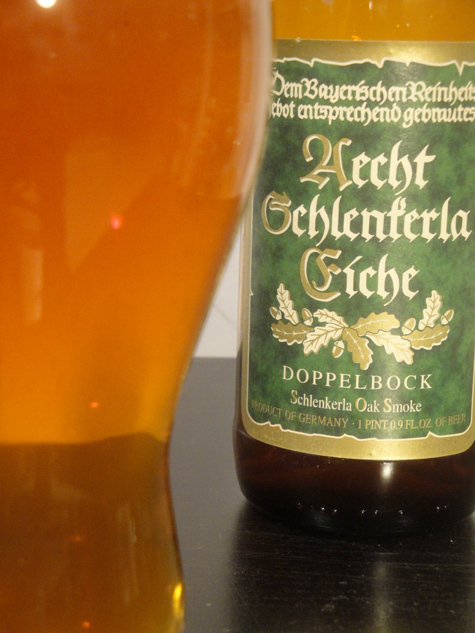 When I had heard Schlenkerla made an Oaked Smoked Doppelbock, I had to try it. I’m a huge smoked beer fan and even bigger fan of the over the top smoked beers of Schlenkerla, with the Urbock being my current favorite. I’ve had lots of over the top smoked beers, many of them tasting like ashtrays or worse. Yes, there is worse then ashtray. Yet these beers from Schlenkerla seem to be able to maintain the malt quality of the beer as well. It makes these beers a lot less one dimensional then other heavily smoked beers. As many of you have noticed I’m not writing many beerpinions lately, not that I haven’t had good beer, but much of it has been cellared and may not reflect what is currently available. Also, I like to let the beer inspire my thoughts and this beer just kicks off my imagination and memories. The aroma puts me back to a campfire in late spring where the days are warm and the nights are cold. The smoke that comes off this beer makes me want to throw a big hunk of meat on the grill. Twice a year a whole group of friends and I head up to the Adirondacks for hiking and steak. We’re talking prime cuts, 2″ thick minimum; Bragging rights count! We end up consuming what seems to be our body weight in prime cuts of beef, expertly grilled over an open campfire. This beer just brings back those awesome memories and makes look forward to the next one in April! I digress as usual. I was very pleased with this smoked Doppelbock, the intense smoke aroma gave way to a nice smokey flavor and finished with a fully bodied typical sweet Doppelbock flavor. It was nice to taste the base beer under the big smoke aroma and flavor. Definitely a smoked beer worth trying, especially if you like your smoke! I am looking forward to trying this one, too. Might take a while, though, since it is nearly impossible to buy one of those anywhere near my hometown of Hamburg, Germany. You would think that German beers are more widely available in Germany than in the US…. Alan, Definitely check it out. I’m not exactly sure what the Helles was, but there was zero smoked malt used in that beer only the years of smoke residue in all their equipment. NIna, thanks for pointing that out. I would have sworn that was an F on the label, but then again I don’t know any German! 🙂 It’s too bad you can’t get any of these beers. Unfortunately my beer store didn’t have that particular Schlenkerla offering, but I did pick up their Marzen, Urbock and Weizen, as well as Spezial Rauchbier. I need to brew my planned smoked Moose Drool clone soon too.